The food truck trend has (finally) made it to Bluffton and Hilton Head. Bluffton being the first to allow food trucks to operate in February 2017. Hilton Head has now approved a food truck pilot program early this month (June 2017). The food truck phenomenon began in California in 2011 at a time when the economy was still in a precarious place. Yet even then, there was still a demand for innovative, high quality, fresh food at a price consumers could swallow. Since then, food trucks have been popping up in cities, seemingly, everywhere! With parks and parking lots full of people lined up to get tasty bites after a twitter post announces where the truck will be that day. So, we’ve finally made it! Bluffton and Hilton Head are on the food truck map. And it only makes sense in this highly entrepreneurial area where one is hard pressed to find a “chain” restaurant, and small, local businesses flourish. I’m always happy to see the small business’ make it, and I love good food. In my book, this is a great addition to our neighboring towns. It’s great to have quick, elevated lunch options where you can meet up with friends, enjoy the beautiful Lowcountry weather and save a few bucks. 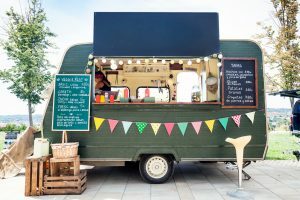 Bluffton food trucks like Downtown Curbside Kitchen, Lowcounty Rocks Lobster and Cool Breeze Shaved Ice) have been operating for some time at local events and festivals or as caterers for private events – and continue to do so. My hope is that this pilot program does well on Hilton Head, and we see more food options, locations, and days of operation spring up. What a great addition that would make for locals and year-round residents to enjoy in spring and fall months! I haven’t gone yet to sample the food from these Hilton Head food trucks – and see what sort of crowd their pulling – but I plan to soon!